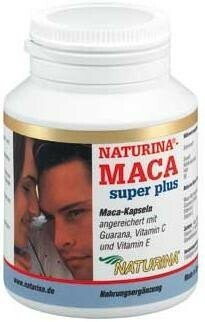 Home Naturina® Maca Super Plus 700 mg Capsules 60 Pcs. Only from a well-balanced nutrition do we gain the energy for the functioning of body and mind and potency. A sensible nutrition supplement is vital today. NATURINA MACA super plus combines the building nutrients of the Maca-root with the stimulating effects of the Guarana plant. The nutrition properties optimize concentration and stabilise body and mind.NATURINA MACA super plus supports to cope with life's requirements. If you are sceptical about taking any chemical substances then NATURINA MACA super plus is the natural alternative. 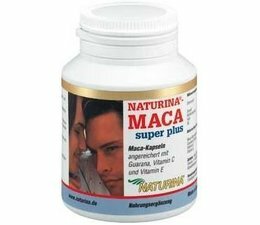 NATURINA MACA super plus - a product of pure nature, no chemical treatment. During manufacturing special heed is given to maintaining the valuable vitamins, minerals and trace elements of the raw material.